Just as modern high power semiconductor amplifiers are composed of cascoded (connected in parallel) lower power amplifier units, so too are super-high-power vacuum tubes. In the case of tubes, a requisite number of triodes (typically) are arranged around the perimeter of the tube enclosure with the inputs and output connected to power dividers and combiners, respectively. Vacuum tubes are still used in high power applications, although it is rare that you will find them with glass enclosures; most are metal and/or ceramic. Over-the-air radio and television broadcasting stations are major users. Richardson Electronics is a major distributor for these types of tubes. Capable of producing millions of watts of pulse power, these tubes are designed for the maximum amount of u.h.f. power output from a single-envelope device. The term "super-power" applied to a new family of grid-controlled amplifier tubes, developed to meet increasing demands for higher u.h.f. power output, is not a misnomer. These tubes, which are capable of producing megawatts of pulse power output and hundreds of kilowatts of average power output, are particularly well suited to applications such as long- and short-pulse long-range search radars and missile-tracking radars, particle-accelerator power sources, broadband radars, space-probe and satellite radars, satellite communications, and r.f. power sources for special-process and heating applications. Peak Positive-Pulse Plate Voltage. 65,000 volts max. Peak Negative Grid Voltage .............. 500 volts max. Peak Plate Current ......................... 325 amps max. D.C. Plate Current .......................... 3.25 amps max. Plate Input (average) .................. 212,000 watts max. Plate Dissipation (average) ......... 150,000 watts max. *For frequencies up to 300 mc. and for a maximum "on" time of 25 microseconds in any 2500-microsecond interval. Voltage ............................. 34,000 60,000 v.
Peak Cathode-to-Grid Voltage ..... 100 300 v.
Peak Plate Current ..................... 260 280 a.
D.C. Plate Current ....................... 2.6 2.8 a. Peak Driver Power Output ...... 150,000 200,000 w.
Pulse (approximate) ... 5,000,000 10,000,000 w.
**In a cathode-drive circuit, with rectangular-waveshape pulses, at 250 mc., with a duty factor 0.006, and a pulse duration of 25 microseconds. Table 1. 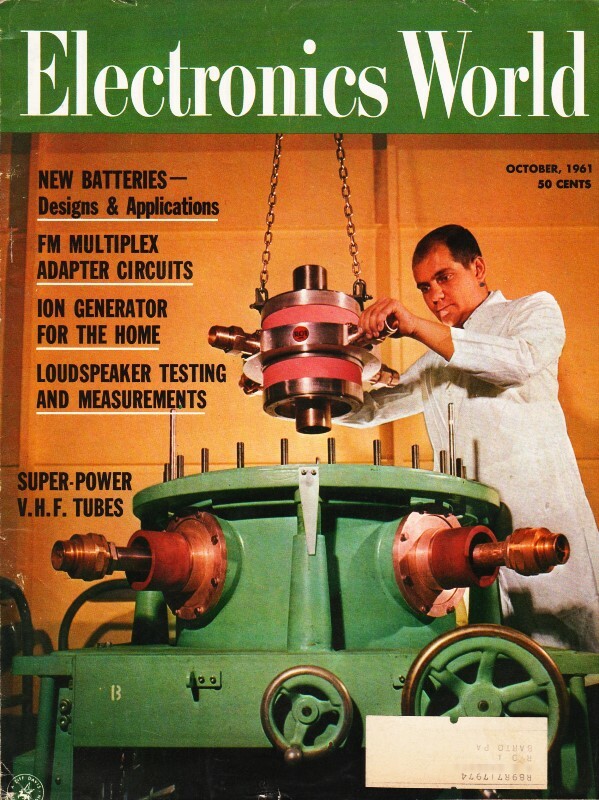 Operating characteristics of type 7835 super-power triode (shown on cover) as plate-pulsed class B power amplifier. Fundamentally, the new family of super-power tubes combines a number of triode units in parallel in a common ceramic-metal, water-cooled envelope. This is done to provide maximum emission-current capability without exceeding a practical electrical length for u.h.f. operation. A total of 96 triode units provide the total electron current required. The cross-section of the active region in Fig. 1 shows the relative positions of the elements in each unit triode and the relation of each unit to adjacent units. 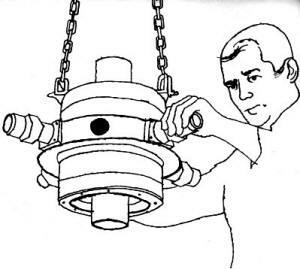 The plate, which is centered about the electronically active region of the tube on insulating low-loss ceramic bushings, forms the outer conductor of a portion of a coaxial output circuit located within the tube. The plate face is made of oxygen-free high-conductivity copper which provides the high thermal conductivity necessary to conduct the heat dissipated on the plate face by impinging electrons to the cooling water on the reverse side. The grid consists of 0.003-inch-diameter pure tungsten wire wound around the circumference of the grid cylinder. 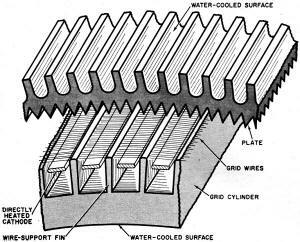 Each grid wire is located in tiny slots across the radial fins that extend outward from the grid block between the cathode, as shown in Fig. 1. A rolling operation firmly fastens the grid wires in position and molds the edges of the fins around the wires to provide the necessary electrical and thermal contacts. 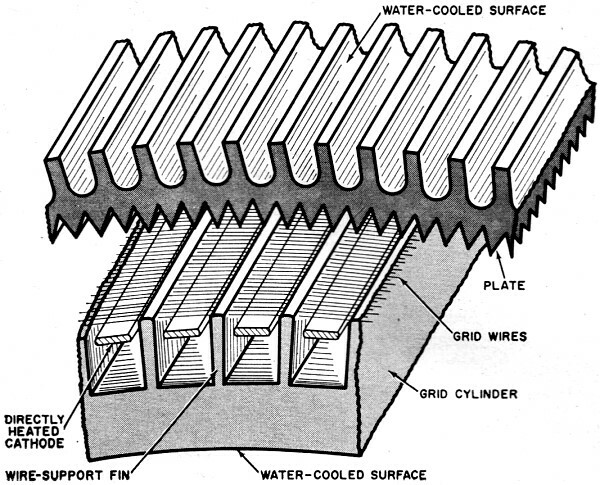 The fins are an integral part of the water-cooled grid cylinder. The thoriated-tungsten filamentary cathode strands have rectangular cross-sections with appropriate reduction in area at either end to compensate for thermal conduction to the supporting structures. Approximately 70 amperes of filament current is required to heat each strand to the normal operating temperature. The total filament power required for long-pulse and c.w. service is 6800 amps at 3.5 volts. For short-pulse service, 1800 amps at 1.3 volts is used. Fig. 1. Cross-section of a portion of the active region of the tube showing the relative positions of plate, grid, and cathode. These super-power u.h.f. amplifier tubes are designed for use with external coaxial-cavity resonator circuits, as shown on the cover, and require no neutralization in grounded-grid operation. The structural elements are arranged for r.f. operation in the fundamental coaxial mode with a voltage maximum occurring at the center of the electronically active portion of the tube. Such an arrangement permits double-ended operation with portions of two adjacent r.f. quarter-wavelengths in the active region of the tube. The double-ended arrangement provides twice as much plate current from a given peak-drive voltage, and power output may be as much as four times that obtained from a single-ended tube with the same load resistance. The d.c. supply voltage would have to be increased accordingly. Double-ended construction also permits the tube structure to be considerably longer physically for a given operating frequency. Consequently, increased area is available for dissipation of d.c. power that is not converted to r.f. power, and structural limitations are less severe than those imposed by the compactness required for a single-ended device. In addition, a more rugged structure can be achieved by avoiding the cantilever support of tube elements so common in single-ended power tubes. At present, these new super-power u.h.f. amplifier tubes are being used in seven types of government end-use equipment, including most of the types listed in the first paragraph. All of these applications use external-cavity circuits that were successfully designed by the equipment manufacturers. Careful cavity-circuit design to reduce voltage gradients and to locate spurious modes outside of the operating-frequency region has resulted in reliable operation at power outputs of 5,000,000 watts. Although it is premature for reports of extremely long life, one tube has already accumulated 6000 hours of service life and another has operated for 4800 hours. Much of the tube development work described was done under the sponsorship of the Air Force. The Air Research and Development Command of the Rome Air Development Center contracted originally with RCA to engage in an electron-tube development program that produced the new design concept. Subsequent Air Force-sponsored programs for the device resulted in the commercial RCA-7835 and RCA-2054. Much of the credit for these developments should be given to the team efforts of numerous other engineers and technical specialists at RCA. 1. Vennard, J. K.; "Fluid Mechanics," 1947, p. 126. Hoover, M. V.; Advances in the Techniques and Applications of Very-High-Power Grid-Controlled Tubes." Proceedings of International Convention on Microwave Valves, May, 1958.